This test is particularly useful if you have just had your smart phone screen repaired. The display check displays 5 test screens to check for different types of display faults. Each screen is displayed for about 3 seconds. 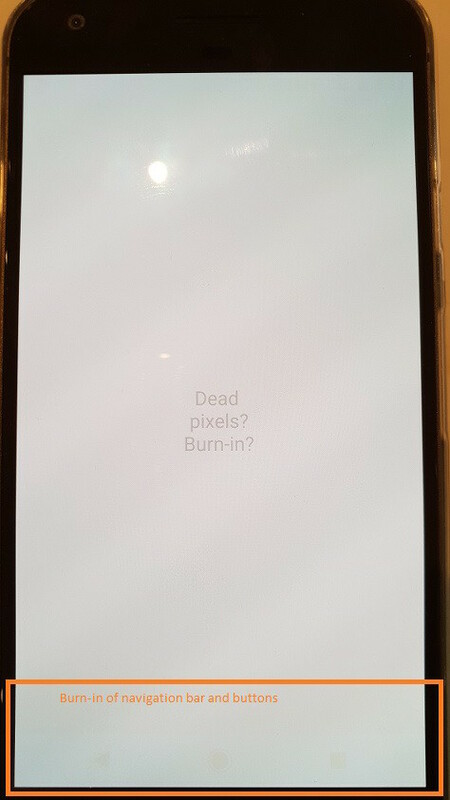 White: Check for dead pixels (i.e. black dots). Black: Check for bright pixels (e.g. white dots). Check for dead or bright lines. Red/Green/Blue: Check the color is consistent across the whole display. Check for burn-in (i.e. permanent discoloration / ghost image). Check for backlight bleed (e.g. white clouds). Select OK is the screen looks OK for each of these tests, otherwise select NOK. 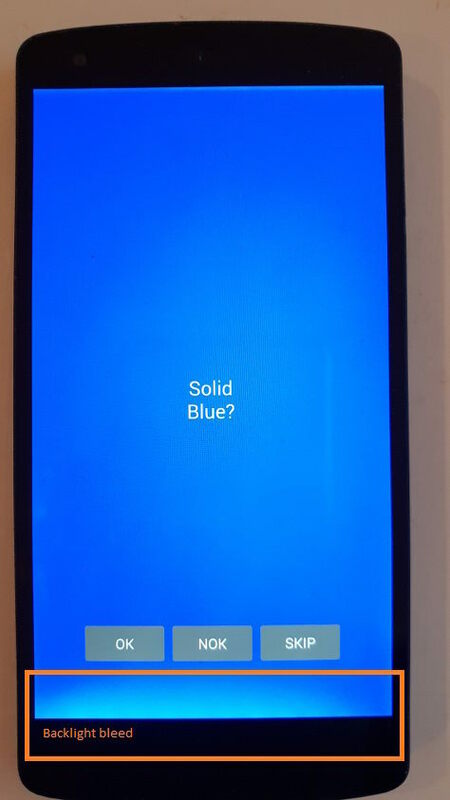 This tests the touch screen (digitizer) for dead areas and 5 point multi-touch. The touch screen test displays 2 vertical lines. You should touch a line at the top of the screen with 1 finger and drag it to the bottom of the screen, then repeat this for the second line. This is repeated for 3 sets of lines, with each set of lines covering different parts of the touch screen digitizer. The most common reason the touch screen test fails is if there is a dead area on the screen. That is, the digitizer does not detect a touch for a small area of the screen. This would normally be seen when tracing a line and the line drawn by your finger is not continuous (drops out). 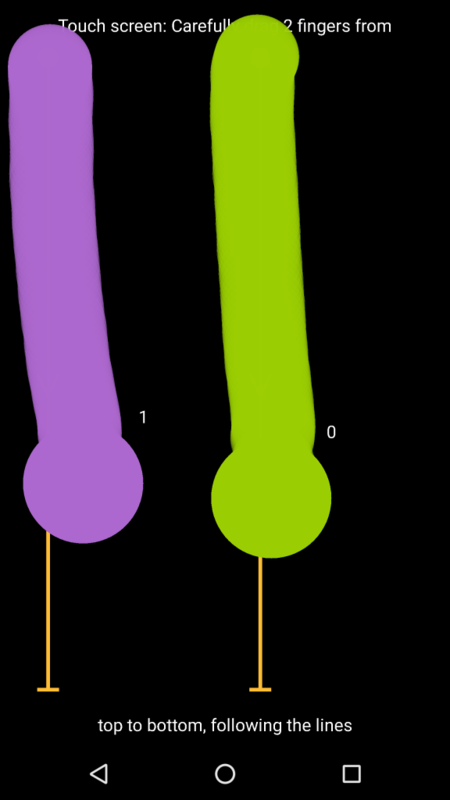 A 5 point multi-touch test follows. Just touch the screen with 5 fingers. Note: This test is skipped if the device indicates it supports less than 5 touch points. It should be noted that some devices support 5 or more touch points, but when certain gesture settings are turned on, the device is restricted to a smaller number. For example, the OnePlus 5T phone supports 10 touch points, however when the “Three-finger screenshot” setting is turned on only 3 touch points are supported. The test will automatically complete OK if the traced lines have been followed on the touchscreen and the 5 point multi-touch is OK. The test will be deemed NOK if a set number of attempts are made and the test has not completed, or the test is not completed within a set time period. If your device has a faulty touchscreen and your device can recognize a touch anywhere on the screen, then you can just tap there a number of times to fail the test and move to the next test or wait for the timeout (between 30 and 90 seconds – depending on the touches already recognized). This shows the basic touchscreen functionality is OK or NOK. 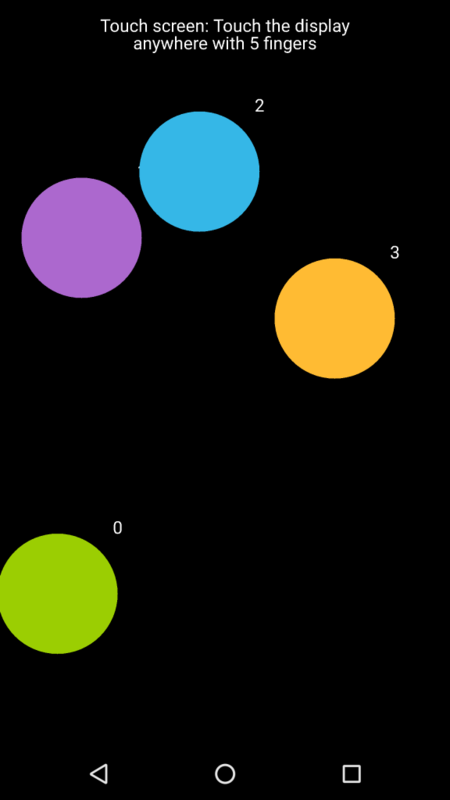 It uses 2D graphics, and hence also shows the basic 2D function is OK.